Frs. Francisco Sandoval, OAR, and Euben Capacillo, OAR, attended the annual priests' gathering with Archbishop Jose Gomez at Our Lady of Angels Cathedral in Los Angeles, California, on October 6th. Hundreds of priests from the Archdiocese gathered with their bishop for a day of fellowship and unity. On October 10th, Fr. Jorge Alberto Niño Gomez, OAR, arrived in St. Benedict Parish from our sister province of Candelaria to help with ministries here. Fr. Jorge was happily welcomed by community and parish alike to begin immediately the many duties our life as religious and pastors of God’s people. He was immediately sent to night school for adult English classes and a tutor was found for him who continues to help him in the afternoons. We welcome Father Jorge Alberto and hope that his time with us will be fruitful and joyous. On October 11th, the “nececidad comite” prepared for Día de la Hispanidad with a dinner dance on Saturday where parishioners were able to mingle and to celebrate the different cultures present at St. Benedict's. The proceeds of the dinner dance went to help with our church renovation project. At 12:30 pm on October 12th, a solemn bilingual Mass marked the parish celebration of Día de la Hispanidad. It began with a procession of flags representing the different Hispanic groups present in this country. There were readings in English, Spanish and Italian with music in English, Spanish and Tagalog. It was a great occasion for the different parish cultures to get together as one and celebrate the one thing that makes us all one, our faith in the One and True God. On the evening of October 16, Frs. Francisco Sandoval, OAR, and Jorge Alberto Niño Gomez, OAR, were invited by the Encuentro Matrimonial Cristiano of St. Benedict to a dinner in honor of priests celebrating World Day for Priests at the Los Angeles Arboretum in Arcadia. They were welcomed at the entrance in the dark with a flashlight and taken to a very elaborately decorated room where they were given a gift and seated at a table. Dinner was served immediately and all present were delighted with a play prepared by the Encuentro Matrimonial couples. Fr. Francisco joined the school festivities on October 31st as they celebrated Halloween on the school patio. Children were given prizes for the best costume and the most original in each grade. Fr. Francisco bestowed the awards although he himself, dressed as a scary clown, did not compete. Halloween Party in the School Patio with Fr. Francisco dressed as a clown. THE 75TH ANNIVERSARY of the foundation of Cristo Rey Church was a highlight of this year’s activities. The Augustinian Recollects have enjoyed a long and wonderful history here and it was through the vision of our community that permission was given for Fr. Jesus Domench, O.A.R. to begin ministering to the Hispanic Catholics in the Atwater Village section of Los Angeles. The small community joined with the Glendale Fiesta Association to raise funds to purchase land for a church. The first meeting in 1939 was held on the Feast of Christ the King and the enthusiastic members of the local community hoped that if their fund-raising activities would be fruitful that they would eventually be able to construct a church and desired that it be called "Cristo Rey," a title which is so dear to the Hispanic community. Masses were celebrated outdoors and in various locations for several years before construction began on the church. It was a joyous occasion when Archbishop John J. Cantwell dedicated the new church on March 12, 1944. The beautiful statue of Christ the King in the sanctuary is a replica of the image in the Recollect church of the Sacred Heart in Manizales, Colombia. The numerous and beautiful statues that adorn the church are an inspiration to the people and a fascination for visitors. A recent issue of the Atwater Village Residents Association described the mission style architecture of the church and the unique interior as well worth a visit. Several of the Augustinian Recollects with Archbishop José Gomez and Bishop Gerard Wilkerson prior to the anniversary Mass. Archbishop Jose Gomez was the principal celebrant of the 75th anniversary Mass on Sunday, November 23, the Feast of Christ the King. He was joined by Auxiliary Bishop Gerald Wilkerson and members of our Province who were able to attend. During the initial planning, Fr. Michael Stechmann, O.A.R. pastor, had invited the Archbishop to participate in the street procession following the Mass. The presence of so many parishioners, led by the young members of a “banda” created an enthusiasm throughout the neighborhood that is still very much a part of conversations. Archbishop Gomez enjoyed the enthusiasm of the day and remained afterwards for over an hour being photographed with parishioners. The festivities continued with a festival and food booths sponsored by various groups and parish families. 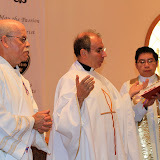 The anniversary celebration was included in the religious and secular press and photographs posted on the Facebook page of Archbishop Gomez were viewed by more than 41,000 persons. Certificates were received from the California State Legislature and the City of Los Angeles and are displayed in the church entrance. The distribution of a brief parish history and commemorative holy cards was welcomed by the parishioners. A good number of former residents of Atwater Village returned for the celebration and it was a delight to welcome back those who called Cristo Rey their “home” during these 75 years. FR. JUAN JOSE GUZMAN and members of the Movimiento Familiar Cristiano took advantage of the feast of All Saints and All Souls to prepare altars for a “Dia de los Muertos” celebration in the parish hall. Parishioners brought photographs to place on the designated altars and following each Mass there was a procession to the parish hall and prayers for our beloved deceased. The parishioners were delighted to share in this tradition and are looking forward to it next year. A MARATHON OF NOVENAS began in November in preparation for the Feast of Christ the King and this was followed by the novenas in honor of Our Lady of Guadalupe and Las Posadas. All of the novenas were extremely well attended and met with an enthusiastic response. LAS GUADALUPANAS continue to be a very active group in the parish with their regular meetings, Sunday breakfasts and cleaning of the church. Prior to the anniversary celebration, they purchased a new rug for the sanctuary area and made a generous gift to the Annual Appeal of the Archdiocese of Los Angeles to commemorate the 75th anniversary of the parish. In addition, they provided the mariachi for the Mañanitas on the Feast of Our Lady of Guadalupe, as well as entertainment and plentiful refreshments in the parish hall after the Mass. Fr. John Oldfield, OAR, represented Tagaste Monastery at a special service of blessing at Good Samaritan Hospital on September 22. Cardinal Timothy Dolan presided at the ceremony, which brought together hospital officials and local clergy as well as the Sisters of Charity and representatives of Bon Secours Charity Health System who partner the services at Good Samaritan. The Tagaste community has had close connections with the Sisters of Charity and the hospital since the 1950s when the Recollects first came to Suffern. The Tagaste SARs made an excursion to the National Shrine of Our Lady of Czestochowa in Doylestown, Pennsylvania, on October 11. The shrine, which is run by the Pauline Order, consists of a beautiful complex of buildings and landscaped grounds, and boasts the largest stained glass windows in the country with images of Polish and Polish-American history. The group attended Mass and enjoyed a tour of the grounds. The Pius X Guild sponsored a number of fund-raising activities during the fall months to support the Monastery, all of them being held in the new Guild Hall. The annual Holiday Boutique was held on Oct. 25, bringing together a number of dealers selling arts and crafts, and the annual raffle took place with a first prize of $500. A second Garage Sale (the first being June 28) was held on November 8, once again featuring dealers and refreshments. Finally, the annual Guild Communion Breakfast was held on December 7. Following a bilingual Mass at which Fr. Michael Rafferty, OAR, presided, some 140 guild members and guests enjoyed an abundant breakfast buffet. As is customary, the Guild presented each community member with a Christmas gift. Bishop Thomas Donato, Auxiliary Bishop of Newark, New Jersey, conferred the ministry of acolyte on Fras. George Valdivia and José Arredondo along with twelve of their classmates on October 26 in the chapel at Immaculate Conception Seminary. Frs. Michael Rafferty, OAR, John Gruben, OAR, and Felix Daganta, OAR, concelebrated at the Mass. The ceremony was followed by refreshments in the seminary refectory; a dinner in honor of our new acolytes was later held at the Monastery. The community was greatly saddened by the death of Brother Joseph Joly, OAR, on November 15 after a long period of declining health. Bishop David Arias, OAR, presided at the funeral Mass; concelebrants included members of the Tagaste and St. Cloud communities as well as Recollects of the St. Nicholas Delegation and local clergy. Brother Joe’s sister Pauline Denault and cousins Elaine and Roger Le Blanc were on hand along with a great number of Secular Augustinian Recollects, Guild members, and friends of the Monastery who were present for both the wake and funeral Mass. Following the Mass, Brother Joe was buried in the community plot at Ascension Cemetery in Monsey, New York; afterward, a lunch was provided by the Guild for all of the guests. Brother Joe had been in residence at Tagaste for some 40 years. He will be remembered not only in the affections of all of his brothers at the Monastery and in the Province, but also in the many artistic creations and practical improvements he left behind in virtually every room at Tagaste. Rest in Peace, Brother Joe! Br. Joseph Joly, OAR, arrives at Tagaste on August 28 to celebrate his 55th anniversary of profession of vows (l to r): Fr. Michael Rafferty, OAR, Br. Joe (seated), Fra. José Arredondo, OAR, and Fra. George Valdivia, OAR.